This week, from March 20th to 24th, the 48th Lunar and Planetary Science Conference will be taking place in The Woodlands, Texas. Every year, this conference brings together international specialists in the fields of geology, geochemistry, geophysics, and astronomy to present the latest findings in planetary science. One of the highlights of the conference so far has been a presentation about Mars’ weather patterns. As a team of researchers from the Center for Research in Earth and Space Sciences (CRESS) at York University, demonstrated, Curiosity obtained of some rather interesting images of Mars’ weather patterns over the past few years. These included changes in cloud cover, as well as the first ground-based view of Martian clouds shaped by gravity waves. When it comes to cloud formations, gravity waves are the result of gravity trying to restore them to their natural equilibrium. And while common on Earth, such formation were not thought to be possible around Mars’ equatorial band, where the gravity waves were seen. All of this was made possible thanks to Curiosity’s advantageous position inside the Gale Crater. Located near Mars’ equator, Curiosity has managed to consistently record what is known as the Aphelion Cloud Belt (ACB). As the name would suggest, this annually-recurring phenomena appears during the aphelion season on Mars (when it is farthest from the Sun) between the latitudes of 10°S and 30°N. During aphelion, the point farthest from the Sun, the planet is dominated by two cloud systems. These include the aforementioned ACB, and the polar phenomena known as Polar Hood Clouds (PHCs). Whereas PHCs are characterized by clouds of carbon dioxide, clouds that form around Mars’ equatorial band are made up water-ice. 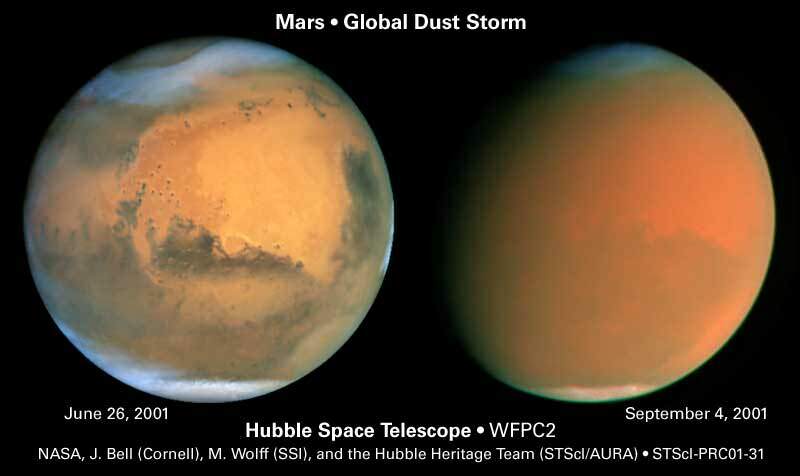 These cloud systems them dissipate as Mars gets closer to the Sun (perihelion), where increases in temperature lead to the creation of dust storms that limit cloud formation. During the nearly five years that Curiosity has been operational, the rover has recorded over 500 movies of the equatorial Martian sky. These movies have taken the form of both Zenith Movies (ZMs) – which involve the camera being pointed vertically – and Supra-Horizon Movies (SHM), which were aimed at a lower angle of elevation to keep the horizon in frame. Using Curiosity’s navigation camera, Jacob Kloos and Dr. John Moores – two researchers from CRESS – made eight recordings of the ACB over the course of two Martian years – specifically between Mars Years 31 and Mars Years 33 (ca. 2012 to 2016). By comparing ZM and SHM movies, they were able to discern changes in the clouds that were both diurnal (daily) and annual in nature. What they found was that between 2015 and 2016, Mars’ ACB underwent changes in opacity (aka. changes in density) during its diurnal cycle. After periods of enhanced early morning activity, the clouds would reach a minimum by late morning. This is followed by a second, lower peak in the late afternoon, which indicated that Mars’ early morning hours are the most favorable time for the formation of thicker clouds. As for inter-annual variability, they found that between 2012 and 2016, when Mars moved away from aphelion, there was a corresponding 38% increase in the number of higher-opacity clouds. However, believing these results to be the result of a statistical bias caused by an uneven distribution of videos, they concluded that the difference in opacity was more along the lines of about 5%. However, what was most interesting was the fact that during one of day of observation – Sol 1302, or April 5th, 2016 – the team managed to observe something surprising. When looking at the horizon during an SHM, the NavCam caught sight of parallel rows of clouds which all pointed in the same direction. While such ripples are known to happen in the polar regions (where PHCs are concerned), spotting them over the equator was unexpected. At present, it is not clear which mechanism could be responsible for creating these ripples in the first place. On Earth, they are caused by disturbances below in the troposphere, solar radiation, or jet stream sheer. Knowing what could account for them on Mars will likely reveal some interesting things about its atmosphere’s dynamics. At the same time, further research is necessary before scientists can say definitely that gravity waves were observed here. But in the meantime, these findings are fascinating, and are sure to help advance our knowledge of the Red Planet’s atmosphere and the water cycle on Mars. As ongoing research has shown, Mars still experiences flows of liquid salt water on its surface, and even experiences limited precipitation. And in telling us more about Mars’ present-day meteorology, it could also reveal things about the planet’s watery past. To see the recordings of Martian clouds, click here, here and here.